Our specialists offer a full line of vending services. We consult with you in order to determine the best combination of machines to fit your company's size and needs. Below are just a few of the many options that we offer. For a more complete and personal assessment, please call one of our representatives. 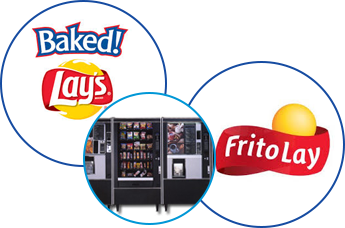 Our snack vending machines are personalized to your specifications. We can supply candy, chips, pastries, gum, or even cookies. For healthier options, we offer a wide variety of "better for you snacks". Our cold drink machines supply 12-ounce cans or 20-ounce bottles, depending on your preference. 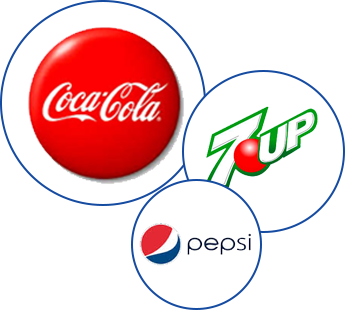 We can provide any variety or combination of brand-name soda, making sure to listen to our customers' input on what types and varieties of sodas they need. Our professionals also offer energy drinks such as Monster™ and Red Bull™, as well as bottled water and cold teas. If you desire a hot drink option, we have machines that supply fresh brewed coffee, cappuccinos, and hot chocolate. When you manage a team of 80 or more employees, ensure they have access to energizing meals with our cold food machines. Our team supplies milk, juice, and microwaveable foods such as hamburgers, burritos, and a variety of breakfast sandwiches.